Jimmy is back! TagPro Halloween event starts on Friday. UPDATE: The event is live! The classic Halloween event is back this Friday. You’ll be disarmed this time around – no pumpkins to throw. But Jimmy is back with a vengeance. He’s armed his zombies with even more stealth. Survivors can no longer see Zombies through walls! Like past events, once the event begins on Friday, it will spawn the first 15 mins of every hour. It will spawn 5 mins early on Pi, Sphere, Origin and Orbit. Yes, there will be new flair to obtain! Winning a match as a zombie gives you a chance to find Candy Corn. Winning as a survivor results in a Bat. Winning as the Sole Survivor earns you a Jack! Why not something totally new? I did make a whole new event but – it wasn’t that fun. They all can’t be insta-winners. So we decided instead of forcing it on a tight deadline, we’d play a classic-mode (with a twist) that most everyone has loved. We’d like to introduce our new TagPro developer: Gem! We are excited to add Gem to the development team. She is a long time community veteran who has been very helpful through the years, especially on the league front. She has built several sites and tools to help with league promotion, draft and management. When she isn’t participating in TagPro, she works as a professional developer building awesome web applications. All of us, Gem included, realize she has a checkered reputation in the /r/MLTP community. In the time we’ve been closely working with Gem, we’ve been impressed with her skills and poise. We know she is a hard worker and will be an excellent addition to the development team. Gem will be initially getting her feet wet in the TagPro code by reworking the moderation tools and adding in some much needed features for leagues/private groups. We look forward to working with Gem and her helping to build a higher quality product for you. As a reminder: Nothing is set in stone! Let us know what you think. The gate graphics are just mocks right now. Some things you’ll notice: Many tweaks and physic changes – but still quite a bit different than classic. The flair on the pucks. The scoring system is a win-by-three system. We have some special effects going on. We are beginning to implement the announcer: FLACCID GRAB! We implemented the auto-panning when respawning due to the popular classic userscript. We are no longer hiding spawning-players from opponents that have TagPro, instead players will spawn with 1 second of untaggable status. 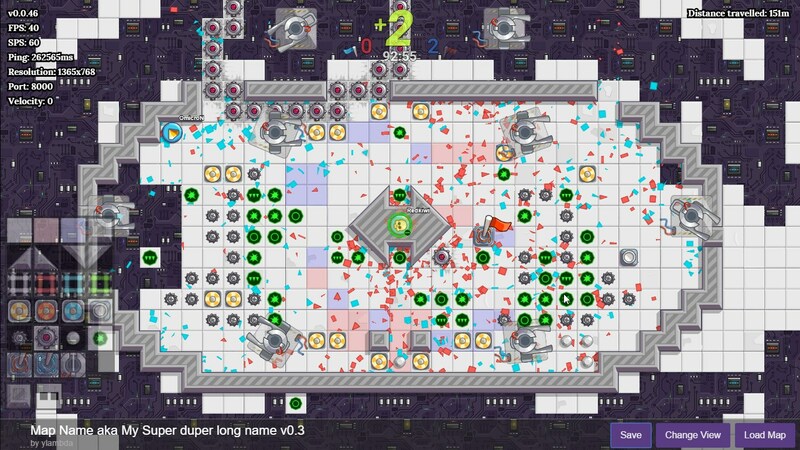 Long Game of TagPro Next on GeoKoala!